For Filipinos, nothing can compare to a home cooked meal crafted with love. However, as times continue to change, Filipinos are often no longer allowed the luxury to indulge themselves and eat their favorite meals as their busy schedules leave them with little to no time for prepping and cooking. 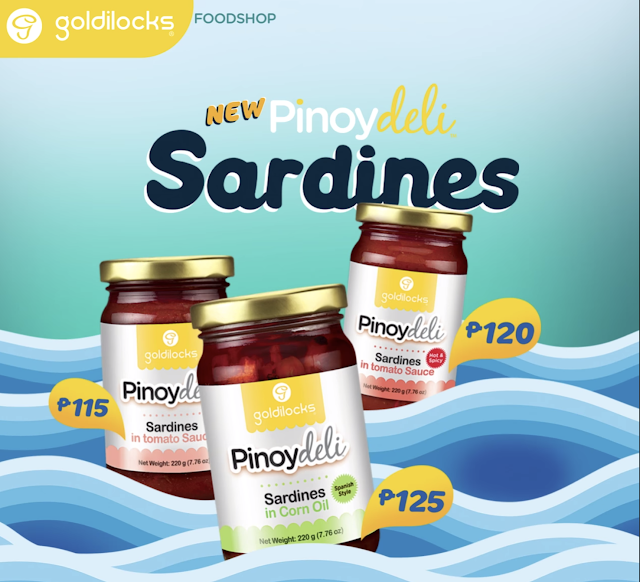 bakeshop created their famous Pinoydeli product line, a delicious selection of classic Filipino dishes catered to the modern Filipino on the go, and this year, Goldilocks is happy to add the latest addition to their Pinoydeli line with the introduction of the Goldilocks Pinoydeli Sardine collection! These iconic meals which come in three distinct variations namely: Pinoydeli Sardines in Corn Oil, Pinoydeli Sardines in Tomato Sauce, and Pinoydeli Sardines Hot and Spicy are considered as a perennial must-have in every Filipino family home and Goldilocks has taken this iconic dish and added their signature treatment of only using fresh and premium ingredients giving Filipinos delicious ready to eat meals at affordable prices! With Goldilocks’s new Pinoydeli Sardines, your favorite meals are now more accessible anytime, anywhere. Althea Korea's NEW Cooling & Calming Products! Cool UV Sun Screen to use this Summer!